This fascinating disc is a compilation of concert music written by some well known film composers. 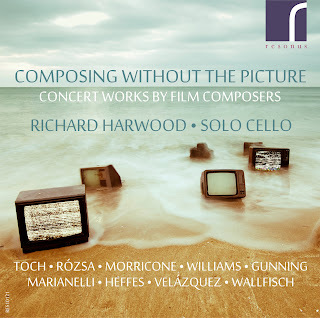 But what makes it so striking is that Richard Harwood as assembled a group of pieces written for solo cello, not a genre you would associate with composers like Ennio Morricone and Miklos Rosza. The recording includes a wide variety of composers, Morricone, Rosza, Ernst Toch, John Williams, Dario Marianelli, Alex Heffes, Fernando Velazquez and Benjamin Wallfisch. The recording is available for download only, on the Resonus Classics label. The first two pieces on the disc are linked to one of the great mid-20th century cellists, Gregor Piatigorsky. Ernst Toch (1887 - 1964) is best known for the scores to Peter Ibbetson, Ladies in Retirement and Address Unknown. His Impromptu for Cello Solo in Three Movements, Op 90c from 1960 was composed for Piatigorsky's 60th birthday. The work is in three movements, Andante Cantabile, Allegretto grazioso and Adagio, con espressione - quasi der Letzte Kampf. This last is likely to refer to Toch's battle with stomach cancer. The Andante Cantabile is rather a free cantilena which Harwood plays with a fine grained singing tone. The Allegretto is a perky, Shostakovich-esque movement, followed by the rather darker Adagio. Again Harwood plays with lovely fine grained tone and a singing line, with darker undertones leading to a haunting end. Miklos Rosza (1907 - 1995) wrote scores for films like Ben Hur, Spellbound and A Double Life. His Toccata Capricciosa, Op 36 (1977) was written in memory of Piatigorsky who had died in 1976. The work seems to have been given to Janos Starker but circumstances meant that Starker's pupil Gary Hoffmann gave the premiere. The work isn't an elegy, instead Rosza wrote 'rather does it reflect something of Piatigorsky's incomparable vitality, open-heartedness, buoyancy and bravado'. It is a strenuous and bravura piece, again with hints of Shostakovich. It is rather less lyrical than expected, but there are lyrical moments. Ennio Morricone (born 1928) is known for his scores for The Untouchables, The Mission, Once Upon a Time in America and The Good and the Bad and the Ugly. His three Riflessi (Reflections) were written in 1989 and 1990 for cellist Mark Varshavsky. The first movement starts from nothing, with awkward arpeggios with increasingly wide intervals, getting higher and louder. The second is rhythmic and edgy, alternating marcato and pizzicato, again rather strenuous. The final movement is quieter and slower, but not more lyrical, comprising of disjointed fragments. John Williams (born 1932) wrote scores for films such as Star Wars, Indiana Jones, E.T., Superman and Jaws. His Three Pieces for Solo Cello were written in 2000, and designed to 'reflect something of the historic African-American experience.' The first piece Rosewood reflects the crack of the work-gang whip, with big spread chords and slapping pizzicatos. Pickin refers to the picking of cotton. It is an incisive toccata with an interesting rhythmic feel and an underlying hint of American fiddle music. The Long Way North is inspired by a poem by Rita Dove, it starts with melancholy singing gradually getting more strenuous, but still singing. 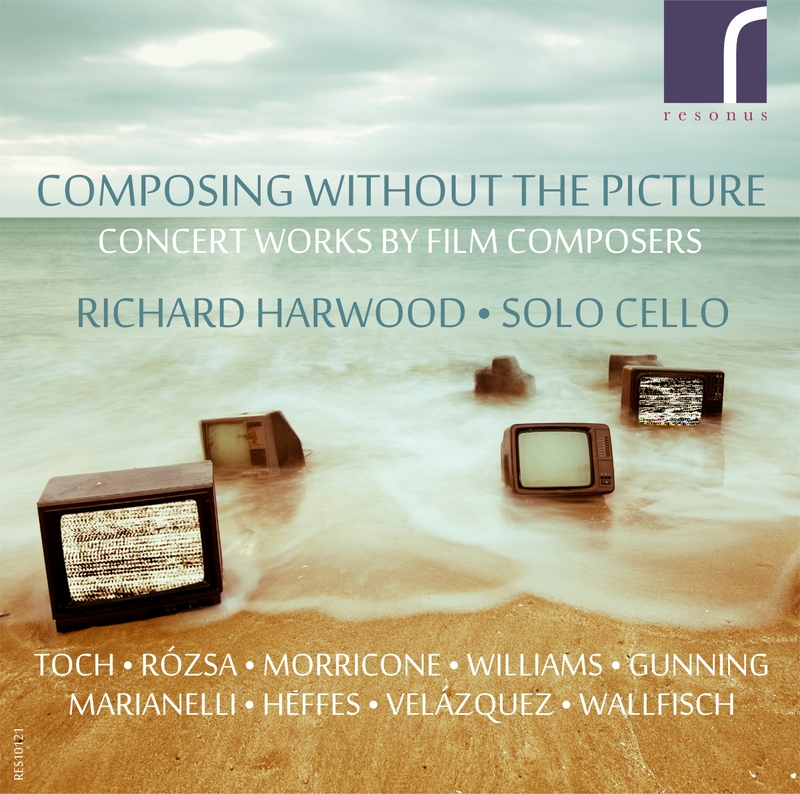 The pieces by Gunning, Heffes, Velazquez and Wallfisch were all written specifically for Richard Harwood for this recording. Christopher Gunning (born 1944) wrote the scores for La Vie en Rose, Agatha Christie's Poirot and When the Wales Came. His Variations on a Slavic Theme from 2012 in fact use a theme which is Gunning's own, albeit with a Slavic cast. It starts with quiet singing and melodic fragments, but develops in speed and complexity. I Think I Do Remember Him is by Dario Marianelli (born 1963) who was responsible for the scores for Atonement, Pride and Predjudice, Anna Karenina and V for Vendetta. The piece is autobiographical, of memory and loss. It is a gentle contemplative arpeggio-based piece. Alex Heffes (born 1971) wrote the scores for The Last King of Scotland, State of Play and Touching the Void. His piece written for Harwood is Theme from 'Touching the Void' (based on the music Heffes wrote for the film 10 years earlier). For the piece Heffes gets the cellist to play a bass drum with one hand whilst bowing with the other hand! The piece is an austere chant-like piece with the bass-drum as a drone. Fernando Velazquez (born 1976) wrote the scores for The Impossible, The Orphanage and Mama. Tarda, una tarda de mayo (2013) is based on memories, memories of a moment which Velazquez may not have lived. The piece is made up of gentle singing wisps of melody, which leads to a more dramatic sections with something of a big tune. Benjamin Wallfisch (born 1979) wrote the scores for The Escapist, Hours and Summer in February. Prelude from 2013, is a short improvisatory prelude, rather austerely made up of fragments. The CD booklet includes detailed notes about each of the pieces. Harwood's performances are exemplary in all respects. There isn't much film music here, nor much sense of the music being related to pictures. Many of the works are rather surprising, given the composers' backgrounds. I am not sure that this disc is one that I would listen to every day, but it sheds a striking light on the composers of some of our best known film music. The recording is available for download only.